The new Panasonic Lumix GH2 fitted with Panasonic's unique 3D stereoscopic interchangeable lens for creating 3D content. Buoyed by market data which indicates that Panasonic Lumix and Micro Four Thirds in general are the clear market leader in mirror-less interchangeable lens cameras, Panasonic strengthened their hand further today by unveiling a new flagship for the Micro Four Thirds Panasonic Lumix G-Micro range, the GH2. In addition, Panasonic formally launched the Lumix G 14mm f/2.5 pancake lens (28mm equivalent) and Lumix G Vario 100-300mm f/4-5.6 Mega OIS telephoto zoom lens. 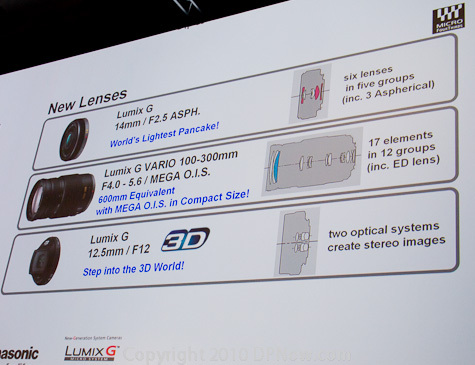 But the show-stealer was the Lumix G 12.5mm f/12 stereoscopic 3D interchangeable lens. 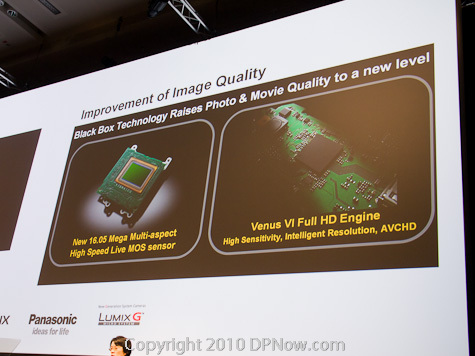 The GH1 gets a new 16MP Live MOS sensor, and a new Venus V1 Full HD image processor. For anyone who thought the Four Thirds sensor format was too small, Panasonic has endowed the GH2 with a 16 megapixels sensor. Despite the hike from just 12 megapixels, Panasonic says it has managed to increase dynamic range performance compared with the old GH1's sensor. It can also pump out its data twice as fast and the ISO sensitivity range has been boosted to a maximum of ISO 12800 compared with the GH1's ISO 3200. 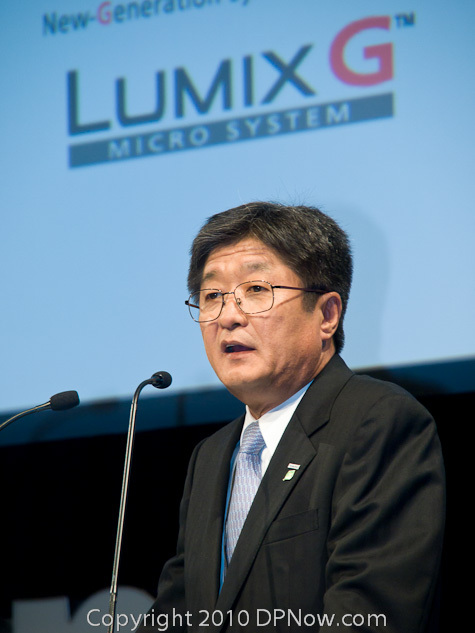 Mamoru Yoshida, who headed up the team that started Panasonic Lumix, was on hand to introduce the latest fruits of the labours of that team. 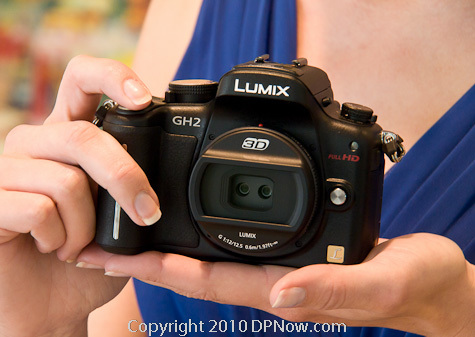 The GH2 is capable of shooting full HD (1920x1280) video at 50 frames per second in 50i mode. Improved image processing performance is claimed to have improved video image quality by 20% as well as resulting in smoother action. Meanwhile, the GH2's electronic viewfinder has been widened, increasing the number of dots to 1.53 million compared to the GH1's 1.44 million. The wider screen better accommodates the GH2's over-size 'multi-aspect ratio' sensor that does not force the cropping of the frame in some wide aspect ration modes. Besides the new 3D lens, Panasonic officially launched the Micro Four Thirds Lumix G 14mm f/2.5 pancake lens (28mm equivalent) and Lumix G Vario 100-300mm f/4-5.6 Mega OIS telephoto zoom lens. Logically, Panasonic has included the touch-screen articulating LCD first introduced with the G2 back in the spring. Some controls have also been rearranged. 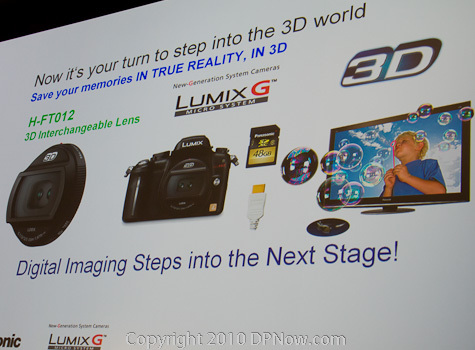 But it's the 3D capability of the GH2, when used with the new Lumix G 3D lens, that Panasonic were keen to emphasise. Although Hollywood is now in the grip of 3D movie production, Panasonic believes that this alone may not be enough to maximise sales of 3D TVs. With an eye on promoting the sales of its 3D flat panel TVs, Panasonic sees user-created 3D content as the way forward. But if you can create your own 3D video and stills, the incentive to purchase a 3D TV will be much greater. As the boss of the Panasonic division responsible for still and video cameras remarked: "Keep your precious moments in 3D." Panasonic now says that its contrast detect AF, once thought of as the Achilles heel of mirror-less interchangeable lens cameras, is actually faster than the AF found in many DSLRs. One area that many felt would hold back mirror-less cameras from the stated ambition of rendering DSLRs obsolete for many photographers was the issue of autofocus speed. DSLRs use a complex system of semi-silvered mirrors and dedicated focus sensors to range-find focus quickly. This isn't possible with mirror-less cameras and finding focus using the main imaging sensor through contrast detection has, until recently, been considered comparatively slow and inefficient. 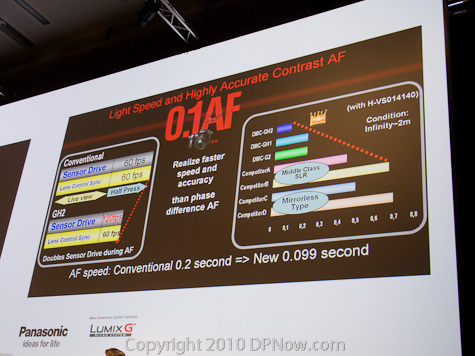 But Panasonic now claims that its work to refine contrast-detect AF has even made it faster than typical DSLRs. Ichiro Kitao (left), who heads the team that decides the design and specifications of Lumix cameras, and Mamoru Yoshida, pose with the new GH2 just announced at the press conference. If sales in Japan are anything to go by, it could simply be a matter of time before we start to see erosion of the lead in the market currently claimed by traditional DSLRs. Panasonic even predicts that mirror-less camera will overtake DSLRs by 2012. We'll have more from Panasonic later in the week.